If you purchase an ebook, please make sure your email address can accept large attachments (2.5Mb) and will not block emails as spam. Before making a purchase, please keep in mind that there are no refunds for books and PDFs. While I was a doctoral student at New York University, I began to work on arranging standards using cluster voicings for a solo piano recital. I came across an interesting and effective technique to use to harmonize a melody with the right hand that freed up the left hand to play a bass line and support the right hand with additional chord tones. A small collection of arrangements was the result. Many years later, I began to refine and apply the technique to other tunes and formulate my thoughts and ideas about the approach that I was using. The result is this book, which could be described, in part, as a voicing technique or method. Although the book mainly addresses the cluster voicing as a five-voice right hand harmonization technique, I felt it was also necessary to explore the cluster voicing in its other manifestations, including its use as a left hand voicing and a two hand voicing for comping. 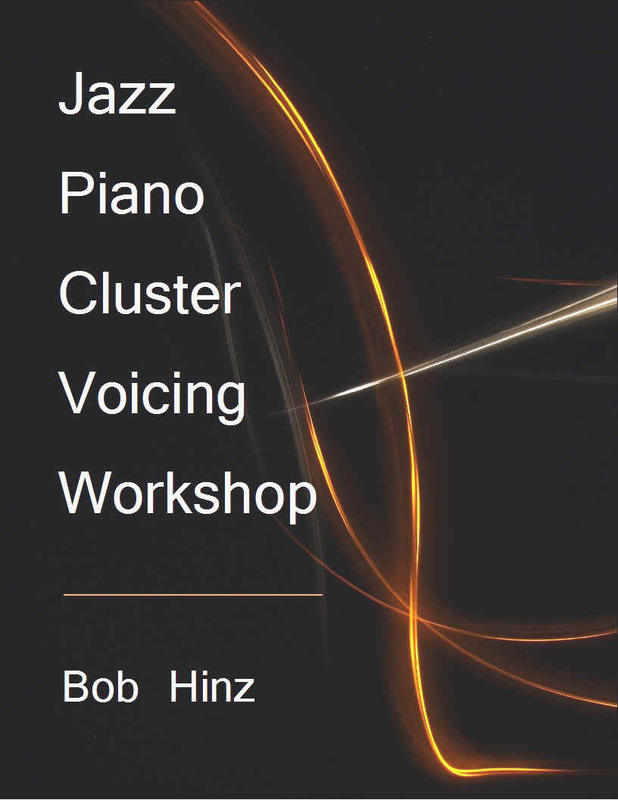 In summary, the book attempts to explore cluster voicings: the way that they can be used to harmonize melodies, create color, embellish chords, and serve as chord voicings for comping. To view or download a PDF of Chapter One (Introduction) from the book, click here. To listen to an arrangement from the book ("I Thought About You"), click here. PDF/eBook: $26.00 You can send payment to bob AT bobhinz DOT com via PayPal if you have a PayPal account. "Your book is excellent! Your core concept of quartal voicings being derived from scales has given me a greater understanding and more freedom in voicing choices than I had before. Your book is a goldmine of useful information and I am enjoying working through it." Mike W.
To listen to an arrangement from the book ("Stella by Starlight"), click here. PDF/eBook: $21.00 You can send payment to bob AT bobhinz DOT com via PayPal if you have a PayPal account. To see a page from the book click here (page 107). To listen to this page (and the following page) click here. PDF/eBook: $28.00 You can send payment to bob AT bobhinz DOT com via PayPal if you have a PayPal account. "It’s great!!" —Susan Muscarella, Executive Director, Jazzschool, Inc.
To see a page from the book click here. Available from Amazon or Hal Leonard Music Publishing ($19.99). 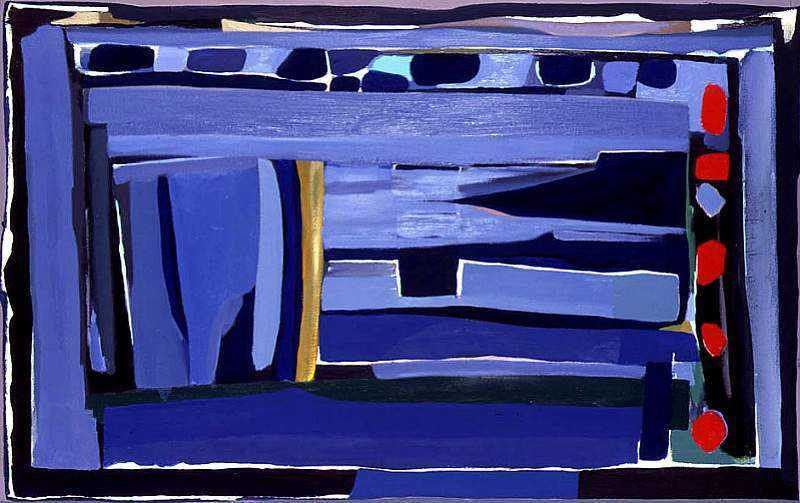 "I’m completing a PhD on the evolution of the jazz piano trio through the artistry of Bud Powell, Bill Evans and Keith Jarrett and am comparing and contrasting their approaches to improvisation – in particular, their respective approaches to melodic embellishment. I’ve been looking for a good, complete glossary of melodic ornamentation in jazz and came across your book. (I will definitely ask all of my students to download it!) It seems that everyone has his/her own take on terminology, so I may create a glossary of terms of my own that is at least relevant to the paper. One way or another, it’s fun working on it! This is such a wonderful book! Thank you so much again, Bob." —Susan Muscarella, Executive Director, Jazzschool, Inc.
To listen to this page click here. 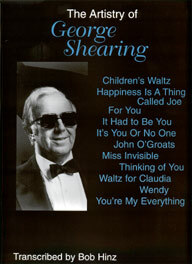 The Artistry of George Shearing includes eleven solo piano performances, all taken from Shearing's incredible 1990 recording Piano (Concord Jazz CCD-4400). The tunes include originals by Shearing, including "Children's Waltz" and "Wendy," and nine other well-known standards: "For You," "Happiness is a Thing Called Joe," "It Had to Be You," "It's You Or No One," "John O'Groats," "Miss Invisible," "Thinking of You," "Waltz for Claudia," and "You're My Everything." Not many of transcriptions of Shearing's solo piano recordings have been published, and Shearing's harmonic approach to these tunes is quite extraordinary. Chord symbols are included for all tunes. 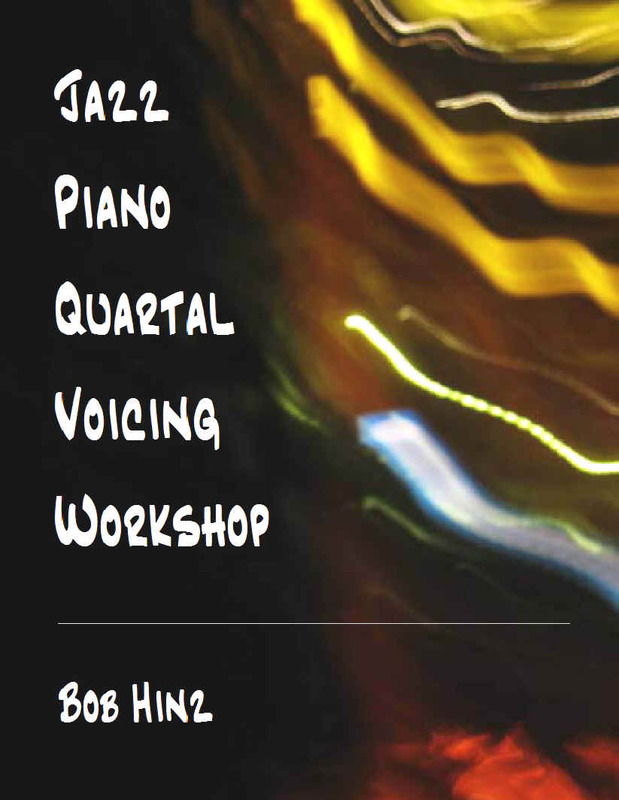 A must have for jazz pianists and serious students of jazz harmony. Available at Amazon and most music stores. $16.95 (plus $3.00 shipping & handling) You can send payment to bob AT bobhinz DOT com via PayPal if you have a PayPal account. 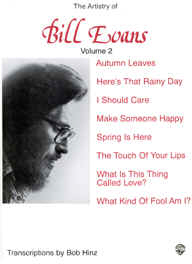 The Artistry of Bill Evans (Volume Two) contains eight note for note solo piano and trio performances. These are transcribed from four of Bill Evans most important and well-known recordings: Alone, Alone Again, Bill Evans at Town Hall (Volume One), and Portrait in Jazz. The tunes include "Autumn Leaves," "Here's That Rainy Day," "I Should Care," "Make Someone Happy," "Spring is Here," "The Touch of Your Lips," "What is This Thing Called Love," and "What Kind of Fool Am I." Since these are complete transcriptions, the text allows jazz pianists—or any other musician seriously interested in jazz—to study Evans' melodic and harmonic approach to these great standards. Chord symbols are included for all tunes. 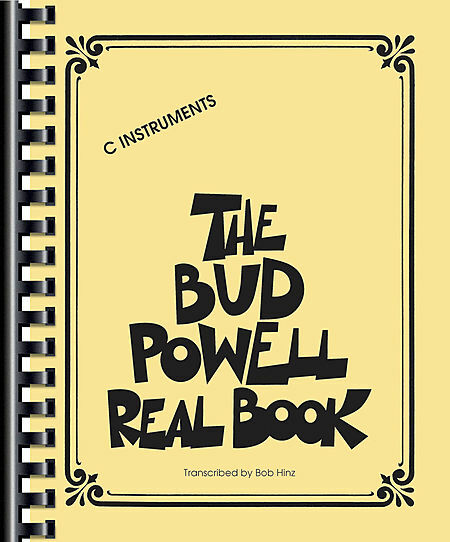 A must have for jazz pianists. PDF/eBook: $35.00 You can send payment to bob AT bobhinz DOT com via PayPal if you have a PayPal account.